In 1906, a French neurologist first described the features of this syndrome that now bears his name. Apert syndrome results from a mutation (or change) in a single gene located on chromosome 10q. There are actually two different mutations on this same chromosome that can produce Apert syndrome: Ser252Trp (or S252W) and Pro253Arg (or P253R). Studies have shown that there may be slight differences in how a child is affected depending upon which one of these two mutations a child develops and that it is not always possible to tell which mutation a child has from just an examination. Currently, no one knows exactly what causes this mutation to occur. Almost in all instances both the mother and father of a child born with Apert syndrome have normal genes, and the mother does “everything right” during her pregnancy. The process of combining a mother and father’s genes together to create a child is quite complicated. In bringing together both parents’ genes, many changes normally occur in different places. If a mutation occurs in just the right spot, Apert syndrome results. One study showed that for all the families tested, the mutation seemed to have started with the father even though the father did not have Apert syndrome. The chances of two parents who do not have Apert syndrome of having a child with Apert syndrome has been estimated to be somewhere between 1:60,000 - 120,000. Could you have Apert syndrome and not know it? The answer is: no. If an adult with Apert syndrome decides to have a family, this condition would be inherited in what is called an autosomal dominant pattern, meaning that there would be a 50:50 chance of passing on the Apert trait for each birth. If both parents have Apert syndrome, there would be only a 25% chance of them not passing on this condition for each birth. Today, it is possible for someone with Apert syndrome to ensure that this syndrome does not get passed down to his or her children by using in-vitro fertilization, testing, and then selecting an embryo that does not have the Apert gene for implantation. Apert syndrome affects multiple places around the body; some children will have certain traits, while others may not. The list below is not complete but does include most of the more common findings. Certain physical findings are more likely to show up depending upon which of the two Apert genes a child has; for example, children with the S252W mutation are more likely to have a cleft palate whereas children with the P253R mutation are more likely to have a “rosebud” hand (where the thumb is fused together with the rest of the fingers). It is likely that there are other genes that we cannot test for today, which are influencing whether or not certain traits are present. Many parents may note that their child sweats more than other children. This condition is called hyperhidrosis and is caused by overly active sweat and oil glands in the skin. When children with Apert syndrome enter adolescence they often develop severe acne, likely the result of these hyperactive glands. Fortunately, there are particular medications (such as Accutane®) that are very helpful in controlling severe acne when it occurs. The skull is made up of separate bones and the spaces between these bones are called sutures (if you want go to see a picture of these sutures click on the (Craniosynostoses section). In Apert syndrome all these skull sutures eventually fuse together but usually the first sutures to fuse shut are called the coronal sutures. These two sutures run from ear to ear across the top of the head; the right and left coronal sutures meet at the top of the skull at the soft spot, or anterior fontanel. With these sutures fused shut, the skull is not able to grow in a normal way to accommodate the growing brain. Specifically, the skull cannot get larger from front to back so instead, the brain grows upward making the head taller. In most children with Apert syndrome the soft spot will split open down the middle of the forehead like a seam tearing open in a tight pair of pants, leaving a large open area of the skull from front to back that feels soft. Eventually, over time this open area will completely close up with bone. We have noticed that children with Apert syndrome seem to actually have 3 different types of skull growth patterns, which we call: Type I, II or III. The most common is Type I, with a wide-open soft spot and a skull that is not particularly tall. Type II skull shapes are taller and may or may not have a ridge running up and down the center of the forehead. Type III skulls, which are the least common, are very tall and the forehead is quite recessed. We believe that the type of skull shape should determine the timing for skull surgery, and this is further discussed in the Treatment section. Inside the brain are fluid-filled areas called ventricles; these contain cerebral spinal fluid, or CSF. One could think of these ventricles as little lakes inside the head that are connected to each other by small streams. Occasionally, these ventricles become filled with too much fluid, causing problems. Most all children with Apert syndrome have ventricles that are larger than normal but, unless a neurosurgeon determines that the enlargement is associated with an increase in pressure, no treatment is required. Less commonly, these enlarged ventricles will continue to expand and can begin to “squish” the brain from the inside, which is called hydrocephalus. In this case, a pediatric neurosurgeon may recommend placing a shunt; which is basically a tube with one end placed inside the ventricle of the brain with the rest of the tube tunneled under the skin down to the abdominal cavity, in order to drain off fluid. At our center in Dallas, we have found that only about 18% of all children with Apert syndrome have needed a shunt. It may be that even fewer children require shunting; this is because many of our patients began treatment elsewhere before coming to our center and may have had shunts placed by neurosurgeons who might not realize that Apert children normally have enlarged ventricles that mostly do not require a shunt. Another option for treating hydrocephalus, which is still being studied, is called a third ventriculostomy, or ETV. Instead of using a shunt to drain off fluid, a connection is made between two ventricles, similar to creating a new stream between two different lakes. Although this operation has a number of advantages, it probably only works well in selected cases. In general, as long as a child’s head circumference measurements stay more or less on the same point on the growth curve, it is unlikely that any hydrocephalus treatment will be necessary. Another condition that may affect the brain is called cerebellar tonsillar herniation, or a Chiari malformation. The floor of the skull has a hole called the foramen magnum, through which the spinal cord exits. Sometimes, part of the brain (the cerebellar tonsils) can get pushed down into this hole like a cork in a wine bottle. When this happens this Chiari can reduce the flow of cerebral spinal fluid around the brain stem and can cause a particular type of sleep apnea called central sleep apnea. With central apnea, a child will every now and then forget to breathe while asleep, lowering oxygen levels to the brain. There is no way to tell if this is happening by watching your child sleep, it is necessary to test for this by doing an overnight sleep study. A Chiari can also lead to a condition in the spinal cord called a syrinx, or syringomyelia, where the center of the spinal cord gets enlarged with fluid causing a small bulge in the cord. Although Chiari malformations were once believed to be very rare in Apert syndrome, we have found that this condition is actually much more common than originally thought, occurring in almost 30% of all our patients in Dallas (Publication #47). We believe that it is important to not just check for a Chiari early in life, but to continue to monitor for the development of a Chiari because these can develop over time. In addition, we have learned that the development of a Chiari may mean that there is an increase in intracranial pressure, signaling the need to enlarge the skull to create more room (Publication #19). Unfortunately, there are no outward signs that might be obvious to a parent if their child developed a Chiari; the only way is by specialized imaging. At the current time most craniofacial surgeons routinely order CT scans on their patients with Apert syndrome. However in Dallas, we have pretty much stopped getting CT scans for a number of reasons. To begin with, it is very hard to tell if a child might have a Chiari from looking at a routine CT scan; MRI scans are much better for evaluating the brain, especially in the region of the brainstem. We have also learned that by doing a careful physical examination it is possible to tell which sutures of the skull are fused without any x-rays (Publication #28). Finally, there have been a number of good studies that suggest that the radiation associated with CT scans might slightly increase the risk for brain and blood cancers over a child’s lifetime (http://www.thelancet.com/journals/lancet/article/PIIS0140-6736(12)60815-0/fulltext) and there is no radiation with an MRI. In addition to looking at the ventricles and seeing if a child has a Chiari, we also look for other potential changes in different parts of the brain. Children with Apert syndrome may have a poorly formed region called the septum pellucidum, or another area that may not form normally called the corpus callosum. Interestingly, a review of our Apert patients suggests that the absence of these structures does not seem to correlate with a child’s mental development (Publication #47).One constant concern for children born with Apert syndrome is the possibility for raised intracranial pressure. We know that children with Apert syndrome have larger brains. Although the skull can get bigger without sutures, the abnormal closure of skull sutures (craniosynostosis) does somewhat limit the ability for the brain to enlarge freely in all directions, leading to slightly higher pressures inside the skull, which in turn may reduce blood flow to the brain. Raised intracranial pressure is most often treated by surgically enlarging the skull (see Treatment below), an operation that usually has to be done somewhere between 2 and 4 times during a child’s lifetime, depending upon how early the first operation is performed and how well it is done. Currently, no one is sure exactly what the ideal age is for the first skull enlargement operation. Studies have shown that most craniofacial surgeons perform the first skull enlargement around 6-months of age. Our research suggests that doing surgery at this early age is not only unnecessary, it is too soon because it impairs the future growth of the skull, often to the extent that additional operations will need to be added in the future. In Dallas, we believe it is safe to delay the first skull surgery well beyond 6-months of age to somewhere around 15-months of age, depending upon the skull type a child was born with (Type II and III skulls need to be expanded closer to a year of age). Not only are we convinced that this delay is safe, we are convinced that by waiting until a child is older before enlarging the skull, we can reduce the total number of lifetime operations. Sometimes parents are told that their child has raised pressure and must have surgery right away. It is very important for parents to find out exactly what has convinced their doctor that urgent early operations are necessary. Our experience suggests that it usually takes quite a while for raised intracranial pressure to have any adverse effects, and most often the biggest effect is on vision, not on mental development. However, it is important that growing children be closely monitored by experienced physicians to make sure that the intracranial pressure is not getting too high. This monitoring is done a number of ways: having a pediatric neuro-ophthalmologist evaluate the optic nerves (raised pressure can cause bulging of the nerve in the back of the eye), following head circumference measurements with growth, monitoring changes in the MRI scans, performing visual evoked potentials (a measurement of the speed that light travels from the eye nerve to the brain) or optical coherence tomography (a measurement of the thickness of the back of the eye), monitoring overall intellectual development, and looking for signs in older children such as headaches or vomiting. Lastly, it is even possible to put a tiny catheter under the skull to directly measure pressure.Most children with Apert syndrome have some degree of a developmental delay. I believe that the multiple hospitalizations and surgical procedures these children are put through may contribute to these delays, although certainly there are other factors at work (sleep apnea and central wiring problems). An earlier review of 80 children with Apert syndrome at our center revealed that the average I.Q. score was 78; however, there was a wide range. Today, children with Apert syndrome probably have higher average scores. A follow-up study of over 130 patients treated in Dallas suggested that development was not influenced by how old children were when they had their first skull surgery (Publication #47), and that children treated at our center from birth had higher developmental levels than those beginning treatment at other centers (although, other factors may have influenced this advantage). Some children with Apert syndrome can have I.Q. levels in the low-to-normal range and go on to college. Obviously, an I.Q. test can only test for one form of intelligence. There are so many different kinds of intelligence that we cannot test for, such as: musical, creative, social, and artistic intelligence. I believe that the most important thing that those caring for children with Apert syndrome can do to help children realize their full potential is to ensure that they do not have sleep apnea and to limit the number of lifetime operations. We recommend that parents challenge their children to develop to their fullest potential. Children with Apert syndrome usually have a downward slope of the eye fissure openings and seem to have bigger eyes. Actually, the eyeballs are normal in size, but what makes them appear bigger is that the bones surrounding the globes (called the orbits) cannot grow forward in a normal way. Some children’s eyes can bulge so far forward (called proptosis, or exophthalmos) that the cornea, or lining of the eye, can become dried out causing scarring that can partially block vision. Occasionally when children with severe proptosis cry, their eyelids can get temporarily caught behind the eyeball. Should this occur, one remedy is to put something like a wet Q-tip under the eyelid to pull it forward, back over the eyeball. Should this occur, it is possible to prevent this for happening again by doing a small operation called a tarsorrhaphy (sewing the outside part of the upper and lower eyelids together). Some children with Apert syndrome may also develop optic nerve atrophy (weakening or wasting of the nerve that transmits vision), which can diminish a child’s ability to see. It is not clear what causes this optic nerve atrophy, but it may be related to chronically high intracranial pressure. The most commonly seen eye problem in Apert syndrome is an imbalance of the muscles that move the eyes, called strabismus. Often, one of the six muscles that move the eye (the superior oblique) may be completely absent. Many children with Apert syndrome require eye muscle balancing surgery to prevent a type of visual loss called amblyopia. The midface describes the part of the face between the eyes and the upper teeth. With Apert syndrome this region is smaller than usual and does not grow in a normal way. The deepest part of the face in Apert syndrome is the top of a shorten nose. Because the midface cannot normally grow forward (actually, growth is abnormally affected in all three dimensions), most children require surgery to move the midface forward more than once over their lifetime. Based on measurements taken from our center’s anthropologist in Dallas, it appears that the midface in children with Apert syndrome grows forward only about 1/3 normal speed and another study suggested that all forward growth stops about age 9 (Publications #25). This smaller midface causes a child’s eyes to look bigger and also contributes to breathing problems caused by the tiny nasal passages. The ears in children with Apert syndrome are usually normally shaped, but may be positioned slightly lower than average. As a result of the midfacial hypoplasia (poor growth), the Eustachian tube of the inner ear does not drain well and children frequently develop fluid behind their eardrums (serous otitis media) or can develop multiple ear infections. Most infants require placement of small tubes in the ear to prevent frequent infections and chronic scarring of the eardrums. In addition to this ear drainage problem, which does get better as children grow, the bones of the inner ear may be partially fused together contributing to a conductive hearing loss. Many adults with Apert syndrome may have some degree of hearing loss, so careful attention to the ears is important in infancy and childhood. Another issues associated with the midface being too small is that the palate, or roof of the mouth, has a very high arch. This high arch pushes up the floor of the nose making it very difficult for children to breathe through their noses. With the floor of the nose raised higher, parents may notice that their toddler’s nose seem to “run” all the time. This problem will improve with time, but is ultimately fixed in teenage years when the midface is lengthened while normalizing how the teeth fit together. Children with Apert syndrome may have a cleft palate. Typically, this cleft only affects the back part of the palate (the secondary palate) and rarely extends all the way to the front. We have noted that about 25% of children with Apert syndrome have an obvious cleft and another 25% have what is called a submucous cleft. A submucous cleft is suspected when the palate appears to be intact, but the uvula is split. With this condition, underneath the mucosa of the palate the deep muscles are not in the correct location. A submucous cleft plate does not require treatment unless there are problems with speech. The remaining 50% of children will Apert syndrome will not have a cleft palate. Recently, we have significantly changed the timing for treating clefts in children with Apert syndrome (see Treatment) finding that there are advantages to delaying this repair for many years. Parents will often notice that their child is a “noisy breather,” especially while sleeping. The most common cause for this is the poor growth of the midface, causing the nasal passages to be smaller and constricted. When babies cannot move air easily through their nostrils, they will struggle to breathe while asleep, which can cause frequent awakenings and may also deprive the brain of oxygen. Sometimes the tongue will be slightly floppier in babies, allowing it to fall back and block the airway. For this reason it is important for babies with Apert syndrome to be positioned to sleep on their sides, or stomach. Finally, the trachea (windpipe) maybe slightly narrowed; further contributing to a breathing difficulty. The trachea is normally kept open by C-shaped rings of cartilage; somewhat similar to the wire surrounding the duct that exits the back of a clothes dryer. Being C-shaped allows these rings to expand when we cough or breath deeply. In Apert syndrome, these rings can be O-shaped, which does not allow the trachea to expand. In addition, children may have something called reactive airways, which is similar to asthma. Some children may benefit from seeing a pediatric pulmonologist (lung specialist) who may suggest certain types of asthma-type medications. We believe that the very first test that needs to be done on a child born with Apert syndrome is not an x-ray or CT scan, but an overnight sleep study, in order to measure the child’s ability to breathe normally and get enough oxygen at night. Fortunately, Apert syndrome is usually not associated with any major heart problems. However, children do have a higher incidence of small holes in their hearts called ASD’s (atrial septal defects) and VSD’s (ventricular septal defects). Rarely, some child can have problems with high heart rates. It is important that all children be screened for these problems by a pediatric cardiologist. Most children with Apert syndrome have reflux (gastro-esophageal reflux, or GER). We believe that this is because of the increased work of breathing that raises pressure in the stomach. This causes the contents of the stomach to travel back up the esophagus and sometimes go into the lungs. When severe, it can cause a baby to suddenly stop breathing and turn blue. There are a number of tests that can be done to look for this condition, such as a pH probe during an overnight sleep study, a barium swallow test, or even an upper endoscopy. We recommend that consideration be given to starting all babies on reflux medication. Finally, a few of our patients with Apert syndrome have been found to have a condition called intestinal malrotation. This condition is best diagnosed by a test called a barium swallow and when found, needs to be treated by a pediatric surgeon. 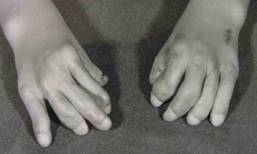 Perhaps the single most identifying feature of Apert syndrome is the associated syndactylies, or fusions of all the fingers and toes. Normally, when a baby is being formed all the fingers and toes start off completely fused together. Then a signal is sent to the hands and feet, which results in the fingers and toes separating. 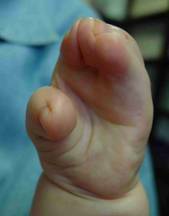 This normal separation process does not occur in Apert syndrome, leaving the fingers and toes fused together. Apert syndactylies are classified according to how many fingers are fused together. In the mildest cases, or a Type I hand, only the index, long and ring fingers are fused. If the thumb is fused to the index finger by a thin bridge of skin, this is called a Type II hand. In the more severe cases, all the fingers are fused together and the thumb has a more complicated fusion to the index finger (This is called a Type III, or “rosebud hand”). Rarely, the thumb may be completely buried underneath the skin of the palm. As a general rule, I have learned that when the fingernails are fused together as a single plate, this usually indicates that the bones of the fingers are fused underneath. In addition, the index, long, ring and small fingers are missing the middle joint (called the PIP, or proximal interphalangeal joint). As the fingers grow, they can develop curvatures or bends that can cause the fingers to cross over each other (this is called clinodactyly). This includes the thumb, which usually grows in a curved away from the index finger. Most often, the toes will have completely separate nails and so bony fusions between the toes are rare. When bony fusions do occur, it is usually only between a couple of the toes. 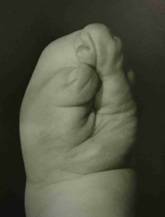 The big toes are often shorter than normal, and frequently grow like the thumbs, by curving away from the rest of the foot. Although the Apert foot appears very wide, our measurements have shown that they are actually pretty normal in width; instead it is the length that is too short. This mismatch between a normal width but a short length makes it difficult to fit shoes properly, so families usually end up having to buy shoes a size too long in order to find a shoe that is wide enough. Over time three bumps may grow on the Apert foot: the first is along the inside edge of the foot, next to the big toe. The second is along the outside of the foot, just behind the small toe. The third is on the bottom of the foot, in line with the second toe. 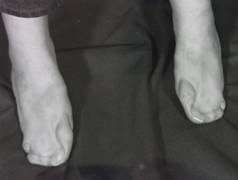 The treatment of these bumps, and the syndactylies is discussed in the Treatment section. Below are examples of the three types of syndactylies, based on the degree of attachment of the thumb. It is possible to get five-fingered hands in almost every child with just two operations. Parents may also notice that as children get older they may not be able to completely raise their arms over their heads (due to restrictions in the shoulder joint), or completely straighten their elbows. The ankle joint is usually located more on the inside of the foot, than in the middle. Finally, fusions of the cervical vertebrae, or bones of the neck, are common with Apert syndrome. For the most part, there are currently no helpful procedures for these joints, although we are looking into an operation that may help the ankle joint over the long-term. The treatment of a child born with Apert syndrome is complicated and is best provided by experienced craniofacial teams at major centers. The following is a brief overview of how we take care of our patients coming to Dallas for treatment. As the result of our seeing a high number of children with Apert syndrome, and performing numerous research studies, our treatment approach is fairly different from what most other doctors might recommend. To begin with, our treatment focus has shifted to, first and foremost, maximizing intellectual development. Our second goal it to significantly reduce the high number of operations that most children normally undergo. The timing for the first skull operation varies significantly depending upon how the skull is growing. A general rule of thumb is to delay the skull surgery for as long as possible. Children treated in Dallas might be delayed until 15-months of age, or even older, depending on multiple factors. The reasons for this delay are complicated but one concern is that our operations will impair skull growth, which means that if surgery is done too soon it can mean more operations will be necessary later. So, it is best to not operate before 11-months of age. As babies grow and get bigger, their total blood volumes go up; we believe that this lessens the likelihood that a blood transfusion will be necessary and also that the operation may be less risky. We routinely recommend that children receive a drug called erythropoietin before surgery to raise blood levels. We have published a study that showed that those getting this drug before surgery had a much lower risk of needing blood transfusions (Publication #20). We also use a “cell-saver” to recycle much of the blood that is lost at surgery, so that it can be given back to the child during the operation (Publication #23). Using this combination of techniques, most children (now well over 90%) do not require any blood transfusions. We believe that reducing blood transfusions also reduces the risks of other serious complications. At our center operations on the skull are always performed by a pediatric neurosurgeon and craniofacial surgeon working together over the course of the entire procedure. We believe that having two experienced surgeons present at all times improves the speed and safety of the operation. In addition, only pediatric anesthesiologists with extensive craniofacial surgical experience are used. One of our pediatric ENT’s will often evaluate the child in the operating room and place ear tubes at the same time as skull surgery, in order to save having to do an additional anesthetic. Typically, skull surgery takes two hours, but the children are in the operating room for 4 to 4 ½ hours total. Whether or not the front half of the skull is brought forward (anterior CVR or FOA), or the back half moved further backwards (posterior CVR), depends upon the findings on a preoperative MRI scan. We do not shave any hair, although many centers still prefer to do so. Many years ago, I changed the typical straight-line incision to a wavy zigzag incision because I learned that when children get their hair wet, it will part right on a straight-line scar making it obvious (Publication #10). Designing the incision in a wavy pattern helps to better hide the scar, especially when the hair is wet. The goal of the first skull surgery is to enlarge the skull to give the brain more room to grow. Once a suture is fused shut, it cannot be “released” in such a way as to permit better growth. This is because it is impossible to surgically recreate a functioning suture; therefore, it is important that the surgery is able to accomplish a significant enlargement. Surgeons use various techniques to hold the skull bones in place after moving them into position. We have previously reported our findings that because of the way that the skull grows, when other surgeons use metal plates and screws to put the skull back together these plates may eventually end up on the inside of the skull with the screws poking into the brain (Publication #12). While I am unaware of any cases in which this has caused a problem, I have nevertheless chosen to only use dissolving stitches to put the skull back together (Publication #21). With this technique, nothing artificial is left behind as the child grows. Dissolving plates and screws can also end up inside the skull of growing infants and can weaken the skull bones, making subsequent operations more technically challenging. Rarely, in a tiny percentage of cases, the dissolving plates and screws will melt into a liquid that may drain out through a small hole in the overlying skin. So, while it is technically a little more difficult to just use dissolving sutures to rebuild a skull, we believe this technique provides the best results with the fewest complications. Many years ago, with the hope of being able to enlarge the skull more than with traditional skull surgery, I evaluated using distraction devices with metal rods poking out of the head that were used to slowly expand the skull. I found that not only was skull distraction difficult for both the child and parents; it also required two operations instead of one (a second operation is needed to remove the distraction device months after the first operation). I also found that distraction deformed the skull, had a higher complication rate, and didn’t seem to provide any better result than doing just a single operation. Therefore, I do not currently recommend this technique for my patients. I also believe that helmets or headbands should never be used on a child with craniosynostosis. These restrict skull growth, which should never be done in Apert syndrome. At the end of the operation in Dallas, the scalp is closed with dissolving stitches. We never use metal staples, nor do we use drainage tubes, because both hurt when they are removed. We also do not put any bandages on the child. Instead, we just wash the hair and comb it out before leaving the operating room. In my opinion, the most critically important step at the end of an operation to enlarge the front half of the skull, particularly for children with prominent eyes, is for the surgeon is to place a dissolving suture that keeps the eyelids partly closed, but not so much that the child cannot see. We have unfortunately seen a number of children operated at other centers who did not get these eyelid stitches and as a result of swelling after surgery, ended up completely losing vision in one or both eyes. Children typically will spend one night in the pediatric intensive care unit before being transferred to the floor the following day. We encourage parents to hold their child in their laps, versus in a crib, after surgery. Today, no narcotics are given to children after surgery; instead, we keep children comfortable using intravenous acetaminophen and ibuprofen (Publication #58), which we have found also reduces nausea and vomiting after surgery. At our center most all children spend only two nights total in the hospital prior to discharge. The risks of the surgery are very small at experienced centers. Many studies have shown that surgeons with the most experience tend to have the fewest complications (Publication #37). We have published a two-center study (Publication #15) that showed no infections occurred in infants undergoing operations for the first time (however, it is still possible for this to occur). The average child with Apert syndrome usually needs two to four operations on their skull over a lifetime. It is very important that children be followed closely to monitor for raised intracranial pressure until at least early teenage years. In addition, it is also important to monitor for the development of a Chiari malformation, which can progress over time. I believe that the single most important factor influencing mental development in Apert syndrome is not raised intracranial pressure, but instead is the amount of oxygen that the brain is receiving while the child is asleep. The inability to breathe normally while sleeping is called sleep apnea. There are two types of sleep apnea: central and obstructive. Central apnea is when the brain “forgets” to breathe. This is often caused by cerebellar tonsillar herniation (a Chiari), or less frequently from raised intracranial pressure. One treatment for central apnea is to enlarge the back of the skull, while simultaneously enlarging the bone around the upper spine to decompress the Chiari (Publication #48). The other type of sleep apnea, or obstructive apnea, is the most common type of apnea in Apert syndrome and is the result of a narrowed or blocked airway (most often, compressed nasal passages). If a child is found to have significant sleep apnea, there are different treatments that may be prescribed, beginning with medications. There are a number of medicines that can open up a partially blocked airway in order to make breathing easier. If medications are not completely successful, the next step might be to consider a tonsillectomy. If a tonsillectomy is not successful, the last option short of major surgery is to try CPAP, which is a facemask that is worn at night that will deliver a rush of air each time the child breathes in. CPAP is usually very effective when worn all night; however, many parents find that their child might pull off the mask at some point, making this treatment only partially successful. If none of the above treatments are able to bring a child enough oxygen at night, then surgery might be necessary. Depending on a child’s age, either a tracheostomy or a midfacial advancement might be recommended. In Dallas, for a number of reasons we recommend tracheostomies for children under the age of 6 years, after which we will consider advancing the midface. There are three basic operations used to bring the midface forward in Apert syndrome: the LeFort I, the LeFort III and the monobloc. The LeFort I brings the lower midface forward from the level of the upper teeth to the nostrils, but this operation is usually not done until children have completed their growth. The LeFort III brings the entire midface forward in one piece from the upper teeth to the top of the nose, just above the cheekbones, and the monobloc brings both the midface and the forehead forward together at the same time. Some surgeons believe the monobloc is a very good operation for Apert syndrome. In my opinion the only good thing about this procedure is that it brings the forehead and midface forward at the same time, potentially saving a child an operation. However, there are numerous reasons why this operation is not offered to our patients in Dallas. To begin with, the ideal time to bring the forehead forward is not the same as the ideal time to bring the midface forward. More importantly, studies have shown that the monobloc operation has a high risk for very serious infections (Publications #8, #66). This may be why the LeFort III is currently the most commonly performed operation for treating the midface in Apert syndrome. Although the LeFort III is a major operation, of all the different procedures done for Apert syndrome it has the greatest impact on normalizing a child’s appearance and improving breathing at night. However, in my opinion most surgeons perform this operation too early; our research suggests that other surgeons operate on average at age 5. We have recently completed a study that showed, following this operation, midfacial growth ceases, so when performed at an early age it will most likely need to be repeated when the child gets older. Based on the results of our study we have found that if surgery can be delayed until after age 7 (and appropriately over-corrected), it is very unlikely that a child will ever need to undergo this operation a second time. The LeFort III is performed through the same incision, on the top of the child’s head that is used for operating on the skull. The bones of the midface are cut across the top of the nose, along the floor of the orbit (under the eyes), and down the sides of the cheekbones. No scars are put on the child’s face. With the traditional LeFort III, after the bones are cut the midface is moved forward and these bones are held in position with bone grafts (taken from the skull) and plates and screws. In young children, the teeth used to be wired together for 4-6 weeks. In older children who have completed facial growth, a LeFort I may be done at the same time as a LeFort III. In 1998, I developed the halo-distraction technique for the LeFort III. This is a technique utilizes a device called the RED (Publications #17, #25, #55), which is actually not red, but purple in color. It gets its name for being a Rigid External Distraction device. The RED is used primarily in growing children. With the RED procedure, the bones of the midface are cut and then instead of pulling the midface forward and filling in the gaps with skull bone, the skin is closed and a halo is attached to the outside of the skull with 8-10 screws. A splint (U-shaped piece of plastic) is attached to the upper teeth and two wires extend forward from this splint to attach to the halo. By turning screws on the halo, the midface very slowly advances forward. I believe that it is better to use a splint and not have any wires going through the facial skin, because they leave permanent scars that I would not want my own child’s face. The parents, or the child, turn two screws on the device 2 to 3-times day in order to slowly (and painlessly!) bring the midface forward. The children are allowed to eat soft foods, may go to school, and can even go swimming while wearing the RED. For some children wearing this device after surgery is easier than for others. Seven to eight weeks later (some doctors make children wear the halo for much longer), the device is removed with a 20-30 minute anesthetic. One advantage of using the RED device is that it is a smaller operation than a traditional LeFort III. However, probably the greatest advantage of the RED device is that it enables surgeons to move the midface much further forward than is possible the traditional technique (based on a studies done at our center). We have treated over 175 children and continue to make fine improvements in this technique. Two different children, picture above, with Apert syndrome undergoing a halo-distraction LeFort III. Other pictures are available in our published studies. Usually, the first thing a new parent notices about their child with Apert syndrome is that they are unable to count individual fingers and toes because they are all fused together. The operation to separate these fusions is more complicated in Apert syndrome than it is when fingers are fused in children without Apert syndrome. In Dallas we separate all 10 fingers and toes in just two operations. I believe that it should not take more than two operations and that no fingers should ever be “thrown out,” which unfortunately is still done today. Based on my experience it is almost always possible to get 10 fingers and I have learned that having a five-fingered hand becomes increasingly more important to children as they grow older (Publication #22). If a surgeon tells you that it is not possible to get a five-fingered hand, I would recommend getting a second opinion. It has also been our observation that most doctors are either unable, or are unwilling, to separate the toes. It is true that separating the toes does not improve a child’s ability to walk. It could be argued that the only functional benefit to separating the toes is that it allows some child to wear “flip flops.” However, we have heard from many parents of children who had not had their toes separated that when they are older they do not want to go to swimming pools, the beach, or take their shoes off to run in the grass, because of the embarrassment they feel about how their toes look, fused together. In fact, separating the toes does offer a very significant “functional” improvement because it helps the child to live a more normal life. It is a common misconception that separating the toes widens the foot. In fact, the skin bridges between the toes in no way helps to keep the toes closer together. The width of the toes is determined by the way the underlying bones grow, some grow straight and some grow curved. In addition, the toes do not grow forward in a normal way, although the width of the foot remains normal. This limited forward growth changes the length to width ratio of the foot, which makes the foot seem too wide. In Dallas, separating the fingers and toes is done by a highly experienced team, which enables us to accomplish a release of all 10 fingers and toes in just two operations. Most other centers recommend three or more operations just to separate the fingers; not only does this force the child to undergo more operations than necessary, it doesn’t take into account the potential negative effects of multiple anesthetics on the growing brain. Therefore, we limit the releases to just two procedures. Usually, children just spend one night in the hospital, and then go home the next day. We send the children home in casts that can be unwound at home 2-weeks later. While it is not necessary to do dressing changes after this surgery, in some instances it can improve the final results. Three months after the first stage release, the second stage is done to complete the separation of all the fingers and toes. For most children the skull surgery comes 3 months after the 2nd stage release of the syndactylies. However, this sequence may be different depending on the child’s skull type. Once children are older than 10-years, another different operation can be done to improve both function and appearance of the hands. During this operation, bends are put in the middle of each finger and the thumbs are straightened. This operation improves fine motor skills and also makes the hand look more normal. This operation can help a child to button shirts, use zippers and tie shoes. At the same time, any sore “bumps” on the foot can be reduced and any bent toes can be straightened. Examples (below) of released hands (top and middle row, Type I hands; bottom row, a released Type III hand with bends put in the left hand already). Another reasons to release the toes (below). Children with Apert syndrome undergo far too many operations and spend too much time in the hospital. In light of recent studies raising questions about the effects of multiple anesthetics on the mental development in growing children, it is all the more important to limit the number of operations. Too often, it seems that children with Apert syndrome are put to sleep for a single small operation, done by one specialist who does not coordinate the care with other specialists, with the result that multiple operations are done every year. Every time a child with Apert syndrome needs to go to the operating room, it is important that all the specialists coordinate their care to gets as much done as possible with each anesthetic. Ideally, families need a single “quarterback” to oversee and coordinate the care among all the different subspecialists. As our experience in treating this condition has grown, we have come to realize that the primary goal in caring for a child with Apert syndrome must be the prevention of avoidable developmental delays, in order to provide a child the best chances for living a normal life. It is also critical that the correct operation be done the first time, and that all efforts are made to reduce complications. Operating too soon can seem like a good idea, but most often causes further problems with growth that require even more operations to correct. It is not uncommon to see children who have begun treatment at other centers but do not seem to have made any progress. So, they have undergone the discomfort of surgery, but the same operation needs to be redone again because it was either done at too early an age, or not performed in the best way. I believe that it is very important that children be given substantial blocks of time away from the hospital so that they can grow and develop to be their best. Ideally, parents need to bring their child to the most experienced craniofacial centers they are able to visit. The busier the surgeon, the fewer the complications and the better the outcomes. Treatment recommendations are constantly changing over time, and will also vary from center to center. It is important to take the time to discuss an overall treatment plan with your doctor, and make sure that all your questions get fully answered (see Choosing a Doctor). Take the time to learn as much as you can, get more than one opinion, and search until you find that physician that you feel has the experience to safely get the best results and the caring to coordinate all the various treatments that your child will need.